Winterize your home now for safe and warm returns! With one of our first major snow storms out of the way, closing schools and delaying garbage pick up, you may have found some things around your house that need some attention. How did the important things like your roof and your water hold up? With nature’s little reminder, it is time to winterize your home. Winterizing your home not only keeps you warm and safe, it also keeps your utility bills down, helps you avoid costly repairs when something fails, and keeps your house ready to sell at any time you decide it might be the time. Today we’ll take a look at the two items that not winterizing can cause the biggest problems, the largest expenses, and the biggest reason home buyers will ask for concessions–your roof and your plumbing. With both these items, hiring a professional is one of the best ways to go, but if you are handy or trying to save some money, here are some things you can do yourself, from the most simple to the most complicated. Check your cap–don’t spring a leak (on your roof)! The easiest way you can start to winterize your entire home is to ensure your roof is in good shape with a visual inspection. Please be careful with ladders! Don’t climb up without someone to steady it for you! As you look over your roof, notice any missing shingles or unusual sagging in the roof. Look at the flashings and the sealants around skylights, chimneys, and any other places where water could get in. Look around at your trees. Are there any branches hanging over the roof or touching the rooftop that could collapse under heavy snow? And speaking of trees, did they fill your gutters up with leaves this fall? Be sure to clean those out or call in a professional to do it. (The pros are usually surprisingly inexpensive). Then go inside and look for any cracks in your ceiling or stains. This could indicate a leak in the roof you can’t see from the top. If you have an attic, have a look at the insulation and check the ventilation. You don’t want any stale air collecting in there as you could end up with icicles and ice dams (which will leak through your ceiling into your home!) Also look for places critters like raccoons or squirrels might find inviting and easily accessible. Shore those up as soon as possible. Next, get ready for the big snows with snow guards. If you don’t have any, we suggest installing some. 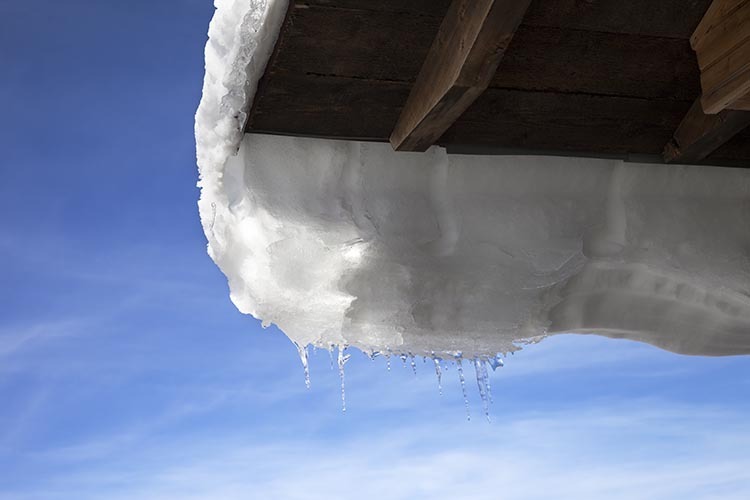 While those big snow avalanches off your roof are kind of fun and certainly delight the kids, they can be damaging to your gutters, your landscaping, pets, and cars. Lastly, and something for which you will probably want to call in a service, is your chimney. Be sure to have it cleaned and checked for ventilation. You want to enjoy a crackling fire in the fireplace this winter–not on your roof or flooring. And you also want a house full of friends and family, not smoke! Not sure where to find a roofing specialist? Check out these possibilities, read through the reviews, and ask your friends and neighbors for their recommendations. Check your gut–don’t burst a pipe! If you have a sprinkler system, then no doubt you’ve had a local service blow it out and shut it down. If not, you better get to it quickly! You don’t want want to have to dig up your beautiful yard to replace burst pipes. And while you’re at it, did you remember to disconnect your outside hoses from the hose bibbs (aka outdoor spigots)? And speaking of pipes on the outside of the house, check those pipes on the outer perimeter of your house. When temperatures drop to 20 degrees or below, the water in your pipes will freeze. The pipes farthest away from the heat source will freeze first, so if they are not already insulated with insulation sleeves, wrapping or slip-on foam pipe insulation. And keep in mind that metal pipes, like copper and steel, are more likely than plastic pipes. Other common tips to prevent your pipes from freezing are to keep your taps running at night and to open the doors under sinks in the bathroom and kitchen so they can get some heat from your furnace. And if you are spending Christmas in Florida and don’t want to pay for heat while you are gone, be sure to set your thermostat no lower than 55 degrees. A summer-like utility bill can cost you big time in plumbing services and water damage repairs. If you can afford it, call in a professional to flush your pipes, add antifreeze to toilets and drains and to service your water heater. You can do it yourself, just be sure to do your research and be sure you know what you are doing. Whether you decide to call in a professional or winterize your home yourself, checking out your roof and plumbing before the deadly cold temperatures of January and February get here will save you a lot of headaches. Who wants to spend their time dealing with roof and plumbing issues, having to stay elsewhere while it is being repaired, and paying those high bills. Take care of your roof and plumbing now and stay warm by the fire with peace of mind this winter.